The type of programmable logic controller (PLC) that is used depends upon the application, size and number of loads to be controlled, need for monitoring and reprogramming the circuit, and amount of control required (ON/OFF to anywhere in between). Budget cost and the knowledge level of personnel who will need to program the circuit/ system and keep the system operating and upgraded must also be considered. The larger and more complex the system, the greater the need for more precise programming, control, flexibility, and monitoring. 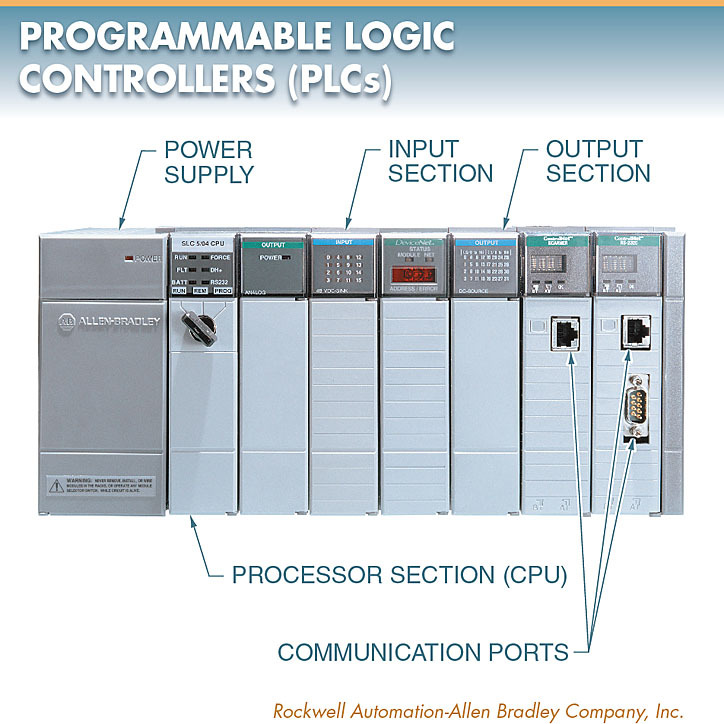 Types of programmable controllers include programmable logic controllers (PLCs), programmable logic relays (PLRs), and programmable automation controllers (PACs). A programmable logic controller (PLC) is a solid-state control device that is designed to be programmed and reprogrammed to automatically control industrial processes or machine circuits. Although PLCs can be used to control almost any type of electrical control circuit, they are primarily designed for the harsher environments found in industrial applications. See Figure 1. A PLC consists of a power supply, processor section (central processing unit or CPU), input section, and output section. Figure 1. 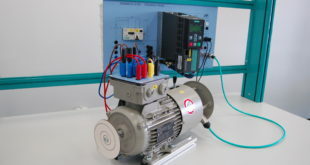 A PLC is a solid-state control device that is designed to be programmed and reprogrammed to automatically control motors in industrial processes or machine circuits. 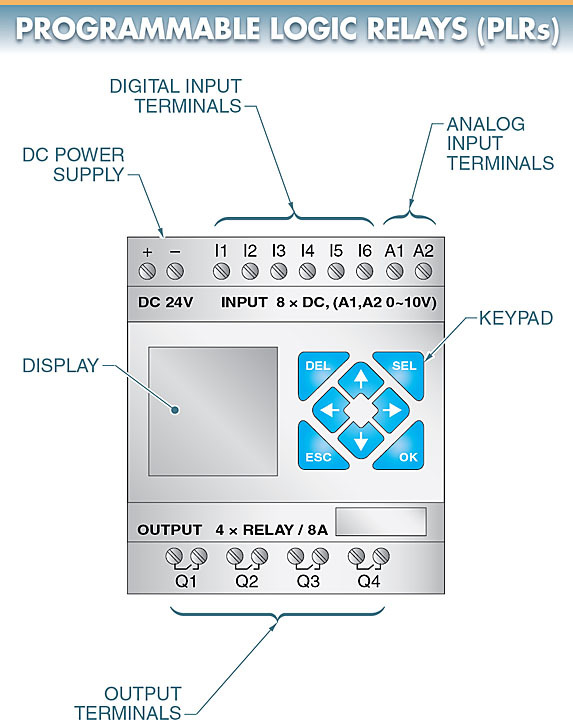 PLCs are designed to control circuits with many inputs and output with individual input and output (I/O) modules that are designed to be connected to 3, 11, 32, or 14 devices. Individual modules can be added and grouped together in a 4, 1, 3, 12, or more units within a rack. There, I/O capabilities can be further expanded by adding additional expansion modules and/or interconnecting different PLCs into a common control system, allowing applications with over 1000 I/Os to be controlled. Smaller PLCs, also called stand-alone PLCs, include the same basic parts as larger PLCs, but they do not allow for interchanging or adding additional modules to them. They can be grouped together to form larger systems or an “expansion” module can sometimes be added, but they are designed to operate smaller circuits that have no more I/O than they have available. 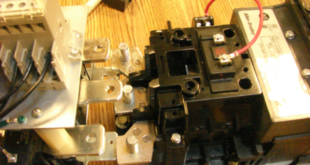 Most PLCs are designed to be programmed using line (ladder) programming or function blocks. Programming is done using the manufacturer’s software designed for the type of PLC being used. Although programs vary based on the PLC size and complexity, they all share common programming devices (inputs, outputs, timers, counters, etc.) 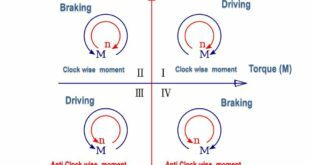 and operating functions (circuit monitoring, I/O forcing, etc.). A programmable logic relay (PLR) is a solid-state control device that includes internal relays, timers, counters, and other control functions that can be programmed and reprogrammed to automatically control small residential, commercial, and industrial circuits. PLRs are basically small PLCs that are designed for more general control applications that require fewer inputs (usually less than 10) and fewer outputs (usually less than 1). Because PLRs are basically small PLCs, some manufacturers call them “smart relays” or list them as “nano” or “micro” PLCs. Regardless of what the manufacturers call them, these PLCs program and operate the same as a small circuit PLC. See Figure 2. Figure 2. A PLR is a solid-state control device, similar to a PLC, that includes internal relays, timers, and counters. Like PLCs, PLRs are designed to be programmed using line (ladder) programming or function blocks. Although they can be programmed using only the keys and display included on the unit, programming, and circuit monitoring are best accomplished by connecting the PLR to a PC because the local viewing window is small and can only display smaller sections of the larger program. However, the local display and operating keys are good for programming passwords and language into the unit (though the unit will usually offer several common languages) and for viewing/changing operating functions such as run or stop modes. A programmable automation controller (PAC) is a combination of a PLC and a PC-based CPU control device that is designed to operate in an industrial environment. PACs can be programmed and reprogrammed using standard PLC languages (ladder or function blocks) or PC languages (structured text, sequence function charts, etc.) to automatically control a large industrial process. PACs are interconnected into a larger system that usually includes human-machine interfaces (HMIs), remote monitors, data acquisition, motion control, or vision control-type devices that are part of the total PAC operating system. Like PLCs, PACs are designed to operate in harsh environments found in industrial applications. PACs are available in self-contained units that include the power supply, CPU, and input or output parts designed for individual control functions. They are also available in rack-mounted units that can form units to control entire systems. See Figure 3. Figure 3. 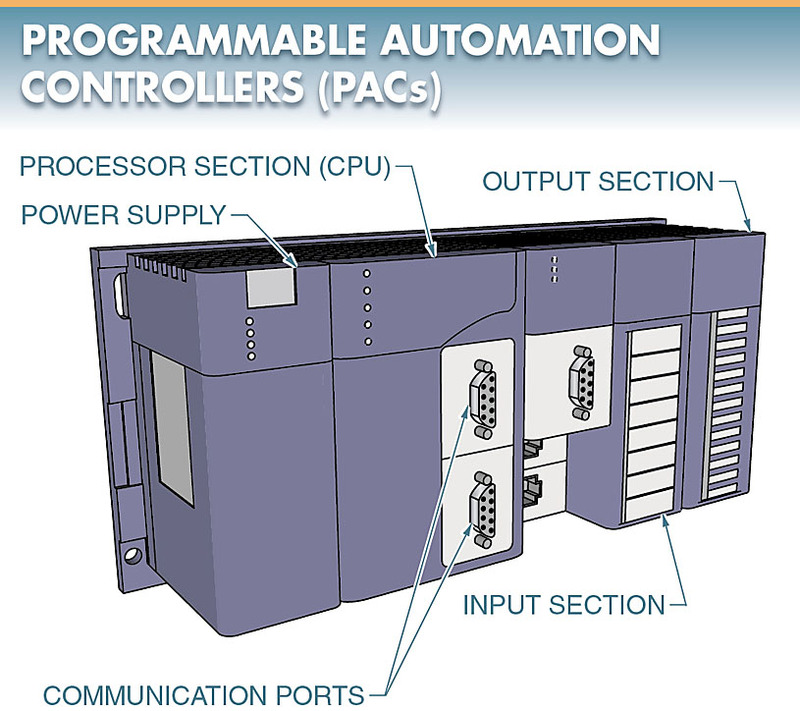 A PAC is a combination of a PLC and a PC- based CPU control device that is designed to operate in an industrial environment. Like PLC units, PAC units can include basic I/O modules, such as digital or analog I/O modules and temperature modules. In addition, PAC units can also include specialized modules, such as serial communication modules, servo/stepper motor control modules, and data acquisition modules. Process voltage (0 VDC to 10 VDC) and current (4 mA to 20 mA) analog control modules are also available for use with control inputs like thermocouples, resistance temperature detectors (RTDs), pressure monitors, flow monitors, distance detectors, strain gauges, and other analog output devices. In general, a PLC is considered the first choice for controlling industrial electrical circuits and systems. A PLR can be considered when a system does not have a lot of loads (outputs) or control switches (inputs) and requires less internal controller timers, counters, etc. Likewise, a PAC can be considered when more advance control is required to work within a large system and PC-based network, such as a large process control system. A good rule-of-thumb is that when the use of a PLC is being considered, a PLR can be used if the control circuit is small enough and will not be operating in a harsh industrial-type environment. 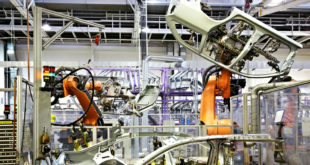 A PAC can be used if the control system also requires remote monitoring, HMI, data acquisition of process conditions, motion control, servo/stepper motor control, and/or vision control. PLCs, PLRs, and PACs continue to grow in their usage, function, speed, and ability to connect into different networking systems so individual units and parts can all communicate with each other. 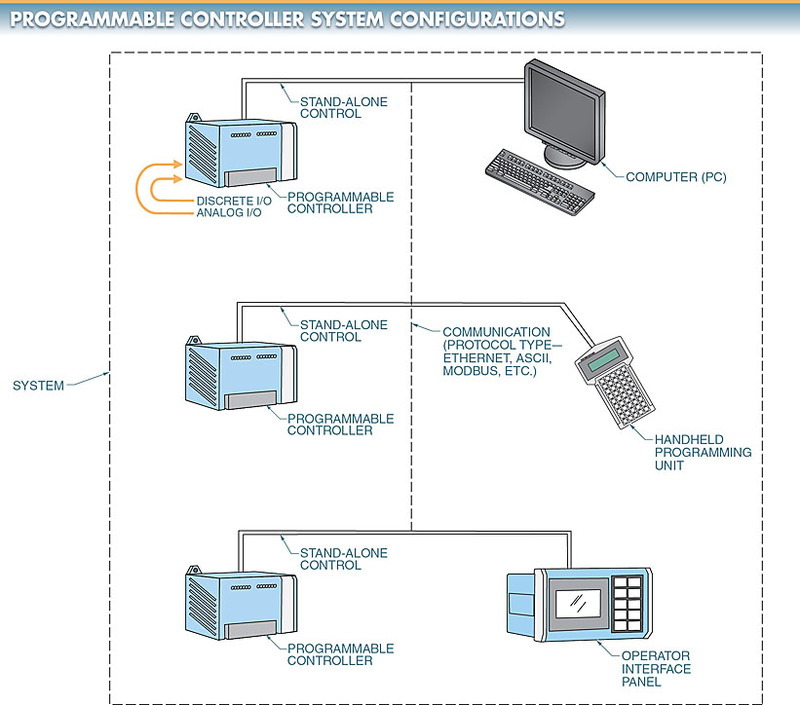 Programmable controllers can be used as stand-alone control devices or configured into a system. A programmable controller can be configured into a system that uses a PC, a handheld programming unit, an operator interface panel, other programmable controllers, or other devices that connect into an electrical system. The amount and level of control between the components in a programmable controller depend on the system operating requirements and cost. The configuration of a programmable controller’s system is determined by the type and quantity of required I/O devices, required communication between devices, programming types and requirements, and any future needs. See Figure 4. Figure 4. The configuration of a programmable controller system is determined by the type and quantity of required I/O devices, required communication between devices, programming types and requirements, and any future needs.